Growing up, I was a huge fan of Little House on the Prairie, despite the challenges that they likely faced as pioneers on the prairie, I still had romantic notions of the simplicity of the life and the focus on the importance of your family. I think sometimes, as you study history and read historical fiction, it has a tendency to leave you with a different impression than the likely reality, not that you don't recognize the differences and realize the challenges that they were facing, but it doesn't tend to really provide focus on the difficulties that they really faced. In The Mark of the King by Jocelyn Green, I got a really different perspective on the early settlements in Louisiana. The story starts in France, where Julianne is serving as a midwife with her teacher as her assistant, a delivery that alters Julianne's future. Finding herself imprisoned for murder, she barters her way out of prison and onto a ship headed to Louisiana, in hopes of connecting with her younger brother who went to Louisiana to serve as a soldier. Little does she know when making the deal, but before they leave France, all of the passengers on the ship are forced to chose a mate (a fellow convict) and marry, as they are headed to the colony to help populate it for France. There is no shortage of challenge and heartache along the way for Julianne. Even in escaping France, she is unable to escape the mark of the king that has been etched into her skin...the mark creating issues for her, but also the potential to finally find happiness in the rough environment of the colony. Jocelyn Green does a great job in bringing the story to life. She paints the landscape and environment of the wilds of the Louisiana colony in a way that makes it very vivid in your mind. You really got to know the characters and felt that you were experiencing the challenges and heartaches along with them. Her description of the experience at sea and on land during the hurricane makes the reader feel like they are in the storm with the characters. I highly recommend this book, as I thoroughly enjoyed it and was drawn in on each and every page. The night that I finished the book, I stayed up way later than I should have, because I simply could not put down the book without knowing the outcome and the fate of those characters that I had grown to love. Those 75 pages were read without the realization of just how the time was passing. 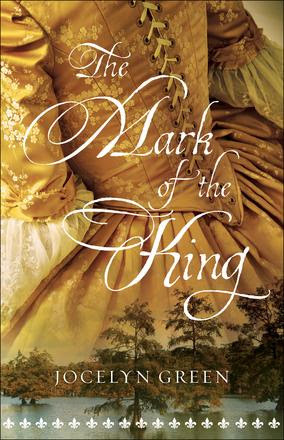 This is the first book I have read by Jocelyn Green but based on the way that she captured me and pulled me into the story, I look forward to reading more of her historical fiction books. She has four others, also set in the early years of the United States. Find more reviews and learn more on the blog tour landing page.